Put the kids to bed and come out for a night of creativity, shopping and fun! Southtowns Catholic School PTG is hosting a night just for mom's. 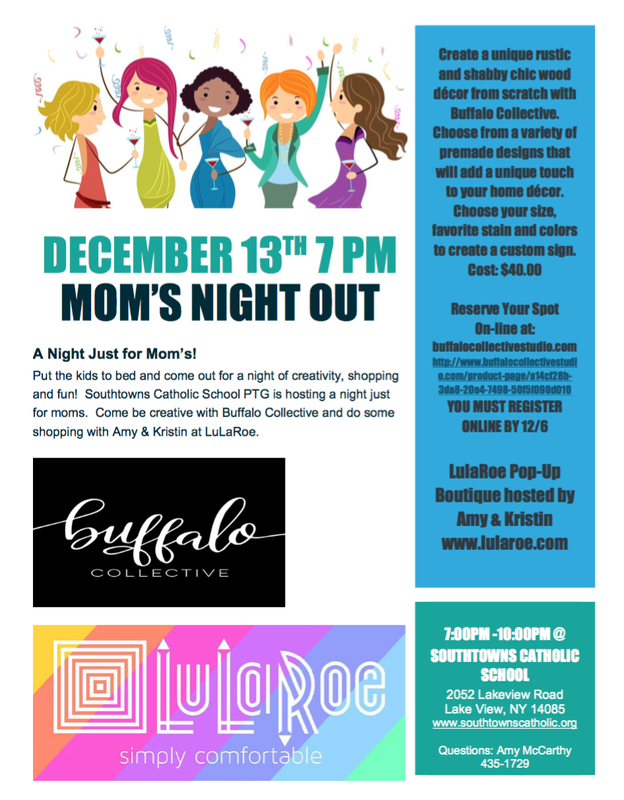 Come be creative with Buffalo Collective and do some shopping with Amy & Kristin at LuLaRoe. Create a unique rustic and shabby chic wood decor from scratch with Buffalo Collective. Choose from a variety of premade designs that will add a unique touch to your home decor. Choose your size, favorite stain and colors to create a custom sign. The cost of the workshop is $40 and you must register online by 12/6 using the link below or at www.buffalocollectivestudio.com. The workshop will begin promptly at 7:00 so please arrive a few minutes early. P.S. You don't have to be a mom to come! Light refreshments and wine punch will be served. Feel free to bring a snack to pass!